Four and three and two and wuh-one! Cue epic dance party music, because everyone’s favorite dynamic duo is coming back. I’m talking about Abbi and Ilana, of course, in Season 3 of Broad City. The girls are coming back swinging (literally—one of their promos features them facing off in a boxing ring) next Wednesday, February 17th at 10pm ET on Comedy Central. We can’t wait to see what hilarious trouble they get into this time around. And if that wasn’t enough, the network already renewed Broad City for a fourth AND a fifth season. BAM! To celebrate the show’s triumphant return, Comedy Central teamed up with artist Mike Perry to design a mural—and to let fans paint it on the side of a building in Brooklyn. You know the colorful animated introduction to the show that changes every episode? Perry is the mastermind behind the designs, and he created a new one specifically for fans to paint together. It all went down on Saturday, and fans lined up around the block to be part of the epic painting event. When I arrived on the scene, the line to paint was already around the block. The people at the start of the line had been waiting for over two hours! You could spot the crowd from a mile away, and not just because of the mass amounts of people—there was also a giant inflatable wacky waving tube man blowing in the breeze. You know, the creature that cracks Ilana up so much on the show. 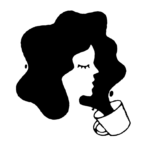 And that’s precisely what made the event so special: There were small details like that peppered throughout the day for Broad City superfans to pick up on. Comedy Central definitely thought of everything. At the start of the day, the mural had a lot of white space, and was ready to be painted. As time went on, it started to get more and more colorful. By the end of the afternoon, we had some bonafide street art on our hands. The paint-by-numbers mural was the main event, but the fun didn’t stop there. While fans waited in line, they could get their photos taken on a Comedy Central red carpet backdrop with cardboard cutouts of Abbi and Ilana. There was also a prize wheel with sweet Broad City swag like T-shirts, posters, colorful beanies and even Abbi and Ilana pillows. Larger than life stuffed animal Bingo Bronson even made an appearance! He was a crowd favorite. So did actor Arturo Casto who plays Ilana’s roommate Jaime. People flocked to snap selfies with him. I chatted with some fans waiting in line about why they love the Comedy Central show, and what their predictions are for Season 3. After leaving their mark on the mural (and relaying some incredible potential plot lines to me), fans received a drink ticket to relax and unwind at Kinfolk, the bar whose wall they just helped decorate. There were drinks, dance parties and plenty of Drake and Kanye blasting through the speakers. Fans could even color a printout version of the mural they just helped paint. 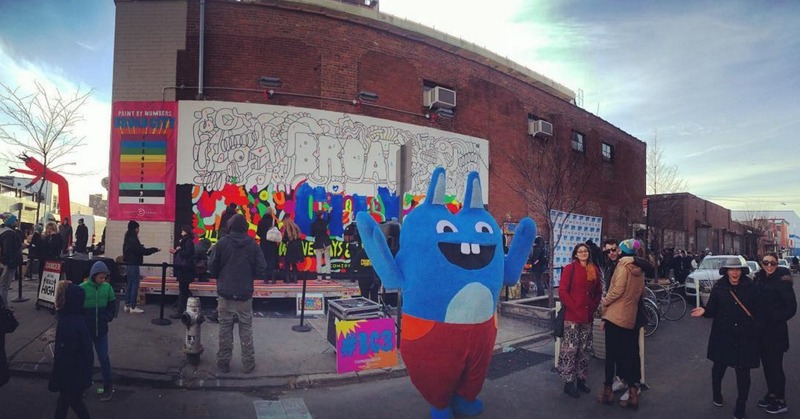 From painting to posing for pics to scoring Broad City swag, the entire event was a huge hit. “[Painting] is so therapeutic. It feels like I’m a kid filling in a coloring book!” remarked a fan as she filled in the mural’s large “C” for “City” with blue paint. Don’t forget—Season 3 of Broad City starts next Wednesday, February 17th at 10pm ET on Comedy Central. And if you’re heading to Brooklyn any time soon, you can see the finished product at Kinfolk in Williamsburg!